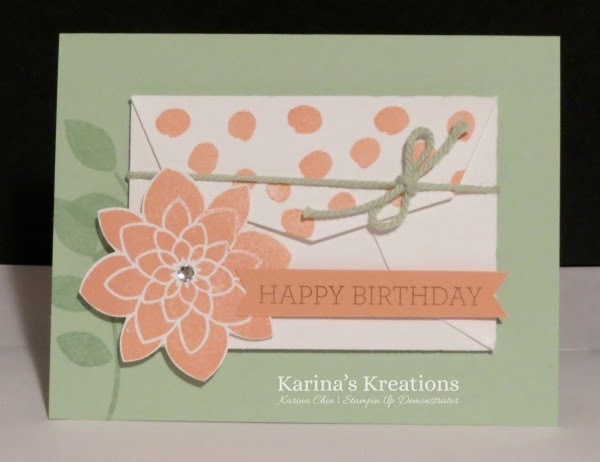 Karina's Kreations: Crazy About You Gift Card Holder Card! Crazy About You Gift Card Holder Card! We can order from the new Occasions catalog now. Yeah!!! This is one of the cards we're making at the 16 card Birthday Bash Extravaganza card class on Jan 25th. Do you want to come? This card is fun because it's easy and uses the Gift Card Envelop and Trims Thinlits die to make the gift card holder. Plus it uses the new Crazy About You stamp set. I love all the fun greetings in this set. Notice the flower? There's a new punch too! I used the Best Day Ever Sale-a-bration stamp set to decorate the top of the envelop. Email me at kchin2@telus.net to attend the class on Jan 25th!